a collaboration led by the Uni of Cambridge with members from BGS, National Museums Scotland, Uni of Southampton and Uni of Leicester. TWeed is going to discover the missing links to how modern species (including you and me) evolved from 359 million year old limbed vertebrates (aka Tetrapods). Romer's Gap begins with the mass extinction at the end of the Devonian. Before this extinction most tetrapods were fish-like but during the following 15-20 million years the land based tetrapods diversified and flourished. 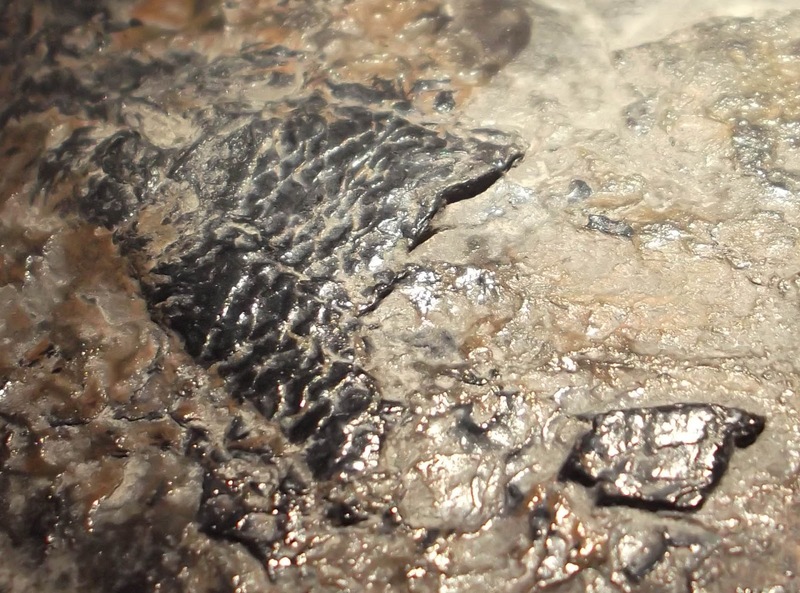 The problem with figuring out how land based creatures evolved during that gap is that there have been no fossil tetrapods discovered from Romer's Gap... until now!! 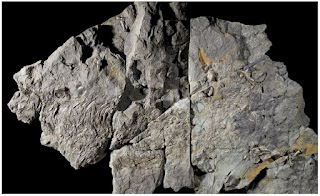 For the first time anywhere in the world, NEW localities of Romer's Gap fossils have been discovered and they consist of NEW tetrapods, fish, invertebrates and plants!! So the TWeed project WILL (i'm a positive thinker) discover crucial, and previously unknown, information about the early evolution of land animals using newly discovered fossil tetrapods from Romer's Gap! The 'scottish' tetrapods that the TWeed team uncover and study will complete our understanding of their evolution- including the eventual appearance of us humans!! "[we] were on hand to talk about the display of fossils collected by Stan Wood from the Scottish Borders. These are just a few of the many specimens already collected and which will form the heart of our investigations. An accompanying poster explained the significance of Romer’s Gap and set the context for these extraordinary and unique finds. The exhibition included not only tetrapod material but examples of fish, shrimps, millipedes and a scorpion. The display attracted a lot of interest and questions from visitors, including some from the Borders area. Offers of help were gratefully received and many indicated that they would be back next year for an update!" there are 6 dinosaurs to spot... here's the one on Level 1! 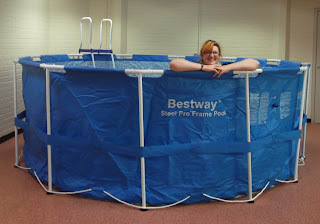 This is me in the pool, just getting a feel for how big it'll be and taking some pics for prosperity! Join us to see the pool filled with water, treasure and our little yellow ROV. Our marine geoscientists will be explaining the uses for underwater ROV exploration, the importance of marine geology and environments as well as showcasing their recent research. 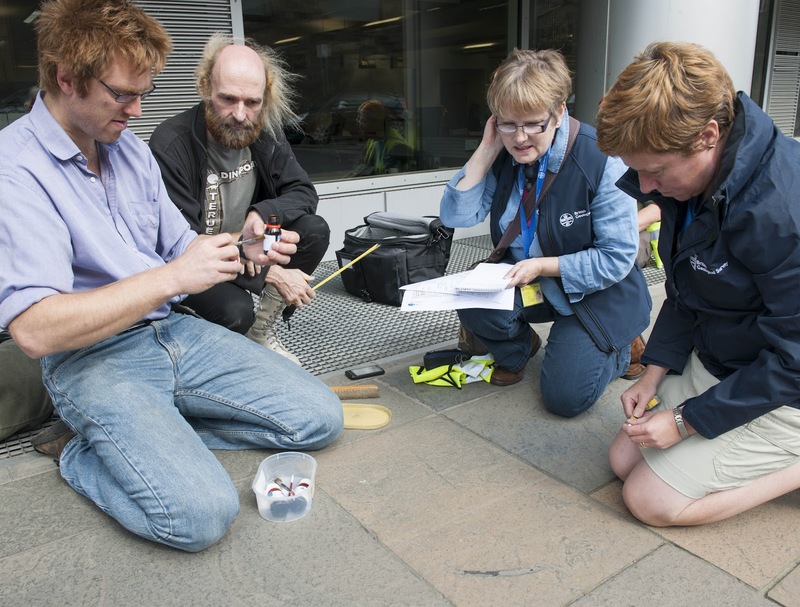 A team went out last week to rescue some fish from the pavements of Edinburgh! Instead of RSPCA officers this was a team of 'rescue paleontologists' for the fish were 400 million year old fossils! The fish were entombed in Caithness Flagstones on East Market Street but thanks to a keen-eyed member of the public they've been located, lifted and stored here at Murchison House (Scottish HQ of BGS). Other specimens have also been spotted in flags outside the Scottish Parliament and the Royal Commonwealth Swimming Pool. 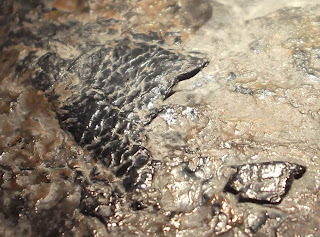 These Devonian fish would have thrived in sub-equatorial lakes (at about the same latitude that South Africa occupies today). Some of our pavement specimens are up to 60cm in size. The operation to preserve and study these fossils highlights the exciting treasures that lie beneath our feet in the city of Edinburgh. Tom is currently preparing the specimens for research and display..... there's the potential to uncover new species of fish and other hidden treasures in the flags. Watch this space for updates from Tom. If you want to see the fish come along to the open day where Tom will be showing them off and explaining the importance of 'rescue paleontology' in our modern world. Project members: Dr Alistair McGowan (BGS, University of Glasgow), Dr Tom Challands (University of Edinburgh, Geovertical), Dr Jeff Liston (NMS), Dr Wendy Turner (NMS), Sally Wild (BGS Murchison House), Dr Emrys Phillips (BGS Murchison House), Brian McIntyre (BGS Murchison House), Eileen Callaghan (BGS Murchison House),John Lawson (City of Edinburgh Council, Museum of Edinburgh), Martin Wilkinson (Transport Officer, City of Edinburgh Council), Peter McCarter (Tarmac), Ken Shaw (Edinburgh Geological Society). Today [6th Sept] was all about GSHP's (Ground Source Heat Pumps) and exploring the potential for getting 'free' heat from the ground into your homes and offices. Our BGS speakers were Diarmad Campbell, Corinna Abesser, Hugh Barron and not forgetting our amazing guest Dave Banks from Holymoor Consultancy who literally wrote the book on Thermogeology! Ground source heat could contribute at least 40% of Glasgow's heating demand! This heat could be extracted through GSHPs using underground geothermal stores of minewater, superficial deposits and bedrock aquifers. Read more about how us modelling Glasgow in 3D has helped discover more about the Heat beneath Glasgow. ﻿﻿ Our friend Sarah Day from the GeolSoc wrote a great summary of the days event and the principles of GSHPs, please take a look and enjoy here: GeolSoc Blog. For BGS research on GSHPs and to download our report 'Ground Source Heat Pumps: Development of GeoReports for potential site characterisation' visit our website page. Alan interviewed by BBC Scotland's Ken MacDonald - this appeared on the 6 o'clock news!